"Your situation is hopeless! Sell your house with us!" We used to regularly receive junk mail from estate agents, which took the form of a folded piece of paper, held closed with a circular red sticker pretending to be sealing wax. The piece of paper offers the recipient - who, frequently, does not actually own the house they're living in - the exciting opportunity to receive a "free market appraisal" of our home. Presumably, the idea of these things is to fool people into thinking that normally, if you ask a real-estate agent to come and see what they reckon your house is worth with an eye to selling it, they charge you $500 just for picking up the phone. You can, of course, actually receive such a "market appraisal" for free. That's a gold-embossed stamp in the bottom right corner of the "valuable Certificate" (it'd look better in a photo than this scan, but I can't be bothered). Note also the stock-certificate-esque border. These "Certificates" remind me of the "surrender pass", a staple of the psychological-warfare business. Most air-dropped propaganda leaflets, along with saying that the dropping side had clearly already won, the drop-ees had been abandoned by their country, the Statue of Liberty is kaput, et cetera, also encouraged enemy soldiers to surrender and provided instructions on how to do so. Some of the leaflets, however, went so far as to make one side into an actual "surrender coupon" or "safe conduct pass". Which kind of gave the impression that you weren't allowed to hang your undershirt on a stick and wave it at Allied soldiers unless you had the correct paperwork. Or that you could surrender without a pass, but might be in trouble afterwards if you lacked a This Man Not To Be Summarily Executed certificate. A few propaganda leaflets had some sort of value. Some leaflets had valuable information on them, like for instance offering rewards to enemy soldiers who decided to help the other side. And a soldier who's trying to surrender may be a bit less likely to be shot if he's waving a yellow safe-conduct ticket in the air. As far as any actual laws-of-war stuff goes, though, the standard air-dropped "surrender pass" was and is every bit as valuable as these junk-mail real-estate certificates. Given sales reps in general, and estate agents in particular, they wouldn't be doing this if it didn't pay off for them. Just because it is physical spam doesn't reduce its efficacy. I think these days the cost of overheads for sticking something through your letterbox vs email spam, actually adds an air of legitimacy to the snail mail kind. On the subject of passes for surrendering with I did once hear of a guy who collected goolie chits. This being a document saying: "I am important to my people and they will appreciate it (to the extent of paying you, the person who has found this downed pilot/aviator etc.) if I'm delivered back to them with all significant anatomical parts still attached. Thank you so much" in all useful local languages. This, while it didn't often deal directly with surrender did sometimes give more certainty over any treatment by persons who might meet the holder, even if they didn't return them to 'their side' directly. I understand that they're still in use and can often be quite fascinating to read; sometimes printed on silk (rolled into wax balls for storage in emergency kits) or on bits of aircraft etc. I think meatspace vendors must be getting more creative lately. I've gotten an actual *car key* in the mail more than once, that "might" start a free car (if you just take the teensy tiny trouble of coming down to our lot...); certificates with gold seals much like yours; "eyes only" signature-required mail -- I actually had to *go to the Fedex office* to sign for *spam*; mortgage refinance offers that look for all the world like they're from my *current* mortgage holder, until you read the fine print... the list goes on and on. Anything they can do to keep you from throwing it in the bin unopened, they'll do. I think we've found a solution to the Fermi Paradox: any sufficiently advanced civilization uses up all available physical & energy resources by sending marketing spam, then dies out. I've often thought that years will be wasted decoding the first interstellar message only to discover it says "Congratulations! This message means you might have won a Spronk-gangle(tm) Foozblunk Twaddler! Just send your chromo-bank initiation code to..."
The Mediocrity principle seems to imply that any civilization will be like ours; I suspect advertising will turn out to be a universal principle, just like gravity, thermodynamics and mathematics, something like an anti-particle for Truth or Culture. I especially like the envelopes from various large-scale charities and sketchy businesses that include a coin. Thanks for the coin. I appreciate it. Now, let me just cut through this plastic-film window with a razorblade and bin the rest of your junk mail... cheers. I once received a free sample of tea with a charity envelope (from and for Fairtrade or something, I think). By the time I got around to drinking it, I had half-convinced myself that the leaves held a shamanic power, and from then onwards the sight of me would repel high-street clipboard-wielders and allow me to go about my daily business without interference. Re needlessly deep analysis of junk-mail sttention-getting strategies, allow me to recommend the new Malki!/Straub collaboration Junk Me Harder. Only one post so far, but it's a good one. Fuzzyplushroom: Personally I like to save (non-worthy) coins or heavy objects up until I have enough to send them back in those free-reply envelopes they give you. Alternatively I try to send one spam as the response to another, bonus points if the choices are somehow ironic. Shadowex3: I'm a big fan of postage-paid envelopes from shady/spammy organisations for just this reason. We just got another one of 'em. 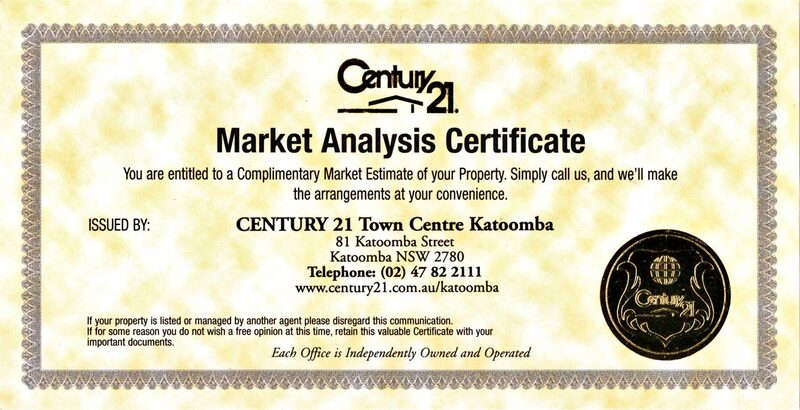 This time two Century 21 offices (Katoomba and Leura) have pooled their resources to send this nonsense out. They're both really close to us, so perhaps I should call them and ask each why I shouldn't go with the other one.